What is the Independent Care Waiver Program? 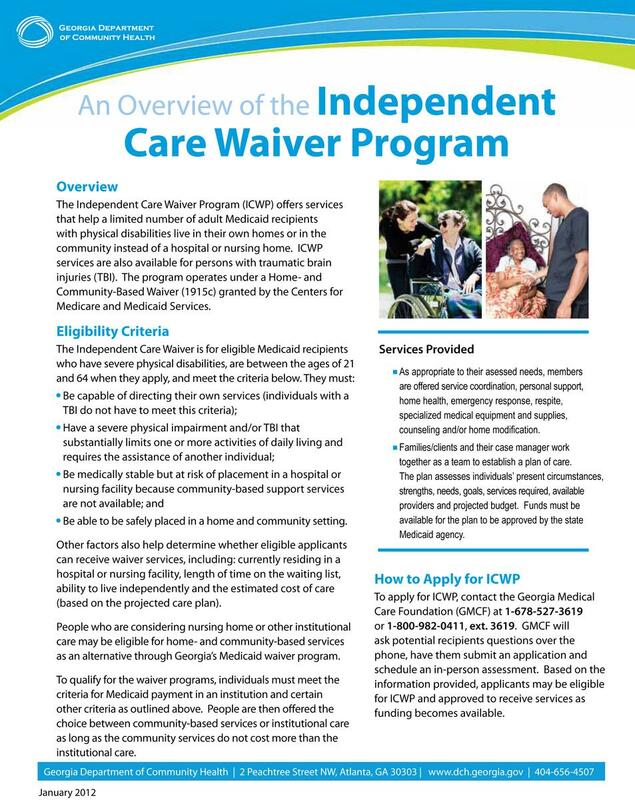 The Independent Care Waiver Program (ICWP) offers services that help a limited number of adult Medicaid members with physical disabilities live in their own homes or in the community instead of a hospital or long term care facility such as a nursing home. ICWP services are available to persons with debilitating chronic, degenerative diseases and also those with traumatic brain injury (TBI). This program operates and is maintained by the Georgia Department of Community Health (DCH) within the Home and Community-Based Waiver (1915c) granted by the Centers for Medicare & Medicaid Services (CMS). Have a severe physical impairment or TBI that limits one or more activities of daily living and require the assistance of another person to carry out these daily activities. Examples: Bathing, grooming, eating, dressing, or other activities required for daily living. Be medically stable but at risk of long term care or hospital placement. Be safely placed in a home or community setting. Individuals considering nursing home or institutional care may be eligible for home or community based services as an alternative through the Independent Care Waiver Program. To qualify for the program, individuals must meet the criteria for Medicaid payment for institutional care. Applicants will then be offered the choice of facility care or home and community-based care. Contact the Courageous Home Care 478-477-7594 or 1-877-227-3402 for more information. For more information visit the Georgia Department of Community Health for information about ICWP.